Cook bacon in Presto® Electric Skillet at 300° until crisp. Remove bacon and crumble when cooled. Pour off excess drippings, reserving 1 tablespoon in skillet. Add green onions; cook at 250° until tender, about 1 minute. Stir in eggs, bacon, and chiles. Cook until eggs are set, stirring occasionally. Sprinkle cheese over egg mixture; cook, covered, until cheese is melted, about 1 minute. 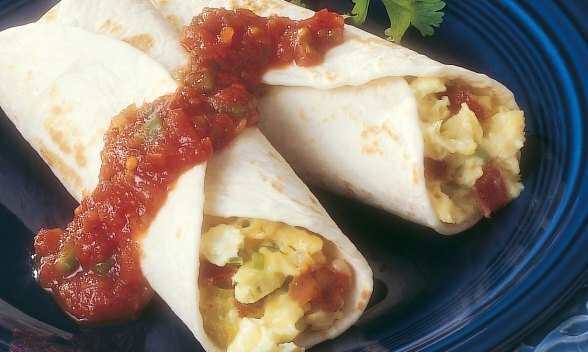 Divide egg mixture evenly between 4 tortillas. Roll up and serve with salsa and sour cream.